Flapping Jacks Yummy Veggie Treats is a mobile catering business selling vegetarian and vegan food, tasty cakes and hot and cold drinks. Flapping Jacks offers high quality, reasonably priced, delicious, vegetarian and vegan options, in contrast to the majority of fast food and mobile catering providers. Flapping Jacks considers its impact on society and the environment by offering healthy alternatives, where possible using only biodegradable packaging and selling Fairtrade products where available. We are based in Woking but cover events across the South East of England. Flapping Jacks is insured for Third Party (Public) and Products Liability Insurance for up to £10 million, and Employer’s Liability up to £10million. 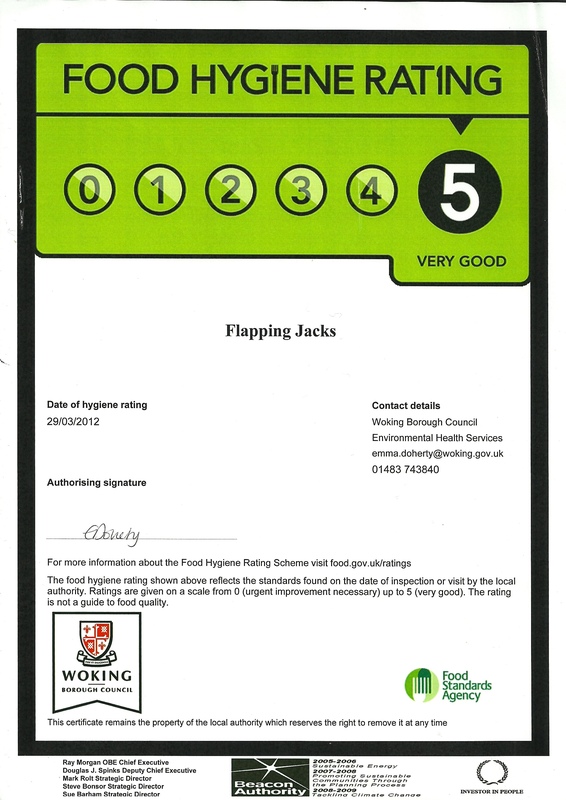 Flapping Jacks has been awarded a Food Hygiene Rating of 5 out of 5 ( the highest possible score) by Woking Borough Council Environmental Health Services. All Flapping Jacks staff hold the CIEH Level 2 aware in Food Safety in Catering. We operate from a mobile catering unit which is approximately 5m long (including the tow bar) and 2m wide. We use a Mercedes Sprinter, long wheel base panel van as a support vehicle and normally park the Sprinter behind the catering unit as it contains freezers and additional stock. Please see photographs of Flapping Jacks trading. Our mobile catering unit can be powered by our own Honda unleaded petrol generator or using a 16amp C form electric socket. We cook using bottled LPG. We hold valid gas and electric safety certificates. Thank you very much for my delicious lunch today!!! I strongly, strongly recommend flapping jacks and always will, I hope to try more soon!! !